You make scrambled eggs and you throw away eggshells. You bake a cake and you throw away eggshells. You shell hard-boiled egg and… you throw away eggshells. Do you know how much of a value ingredient you discard each year? Eggshells are remarkable source of micro- and macro elements. Read below, why you should never dump eggshells. Eggshell is a free source of minerals. Definitely too often you get rid of it without giving it any thought. Then you buy supplements in the pharmacy, that are expected to equalise deficit of nourishing ingredients in the organism. 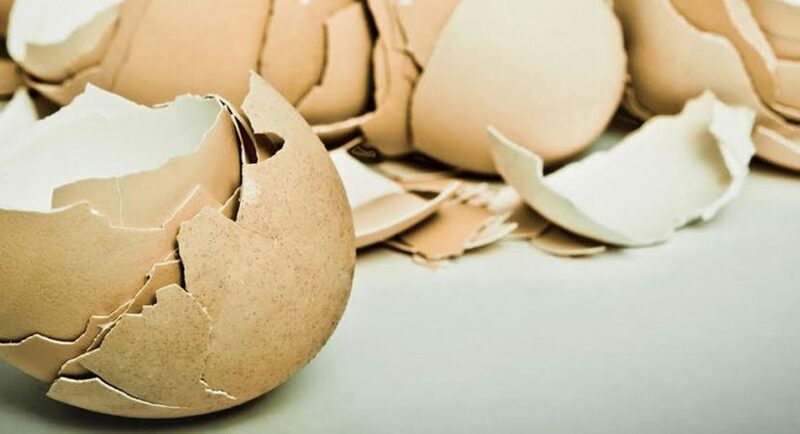 Eggshells are made in 95% of inorganic compounds. There are 25 minerals that can be found in it, including salts of calcium, but also selenium, copper, zinc, molybdenum, sulphur or silicon. Remedy for irritated and prickle skin is in the reach. You just need to pour small amount of apple cider vinegar on eggshells to soften them. After 2-3 minutes eggshells should be soft enough and you can take them out of the vinegar and place on irritated area. Compress with eggshells will instantly sooth all irritations. It is commonly known that eggshells are a rich source of calcium; macro element really important for bones development. There are more than 20 other minerals present beside this one. For this reason eggshell can effectively replace dietary supplements. Empty eggshells have to be blanched in an oven for about 10 minutes and when they dry they have to be ground into the powder. One tea spoon of eggshell powder added to, e.g. yoghurt each day can take supplements place. Aroma of your favourite coffee can evaporate real quick. You do not have to resign of your morning coffee aromatherapy. Before you pour water on your coffee, put eggshell at the bottom of the cup. After few minutes take them out. Coffee will gain sweet taste and intense scent, and additionally it will be enriched with valuable micro-elements.